My husband LOVES dessert. After dinner, he always seems to be in the mood for dessert, heading almost immediately to the pantry to grab a little something sweet to snack on. Since we’ve been really trying to focus on eating clean, I’ve been working on a few simple dessert-y things for him to enjoy after dinner. I had a few prepped sweet potatoes in the fridge, and I wondered – could I make a sweet dish out of this? 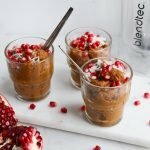 I did a quick check of the other ingredients in the house, saw the blender, and thought to myself, “You can do this!” And Sweet Potato Chocolate Mousse was born. I’ve experimented a few times since then, so here’s the final recipe. Made with cocoa, dates, coconut milk, and the secret veggie your kids will never suspect, sweet potato! 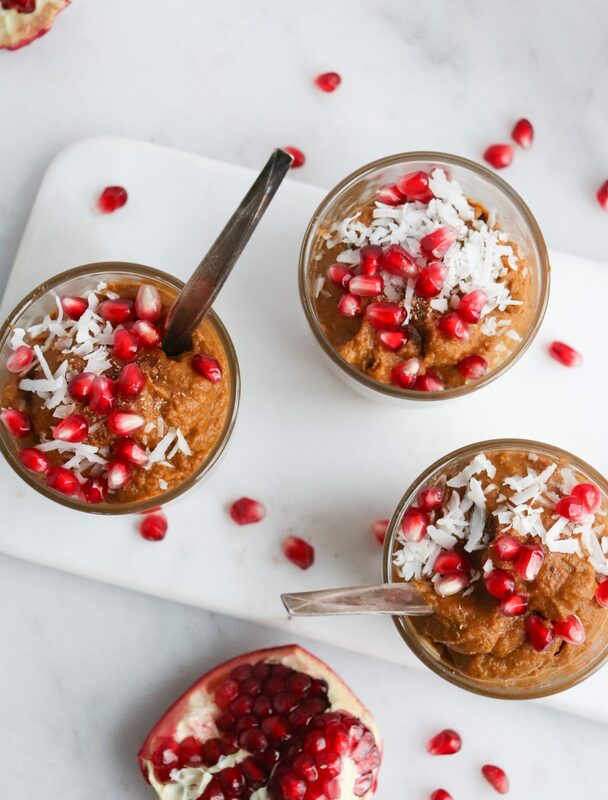 The texture is creamy and dreamy, and when you top it with some coconut flakes and pomegranate, every bite is just perfect. Here’s a pro-tip: When you bake the sweet potatoes, let them cook a little longer than you would normally. 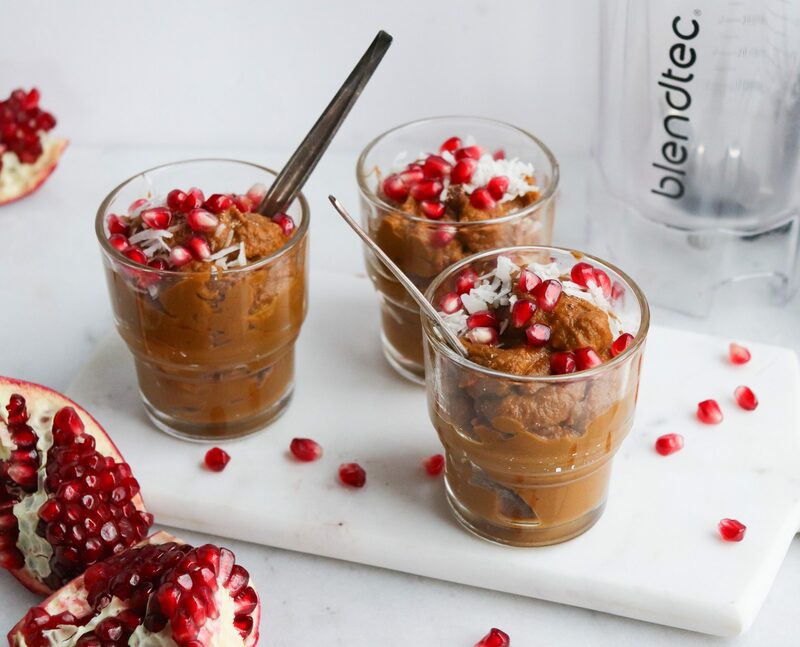 It’ll let the sugars caramelize and give you an even sweeter mousse. A simple dessert made with only clean ingredients – and full of secret veggies for your picky eaters! Add first 6 ingredients to a blender or food processor, then secure the lid on top. Blend on a medium high speed, scraping the sides as needed, until smooth and creamy. Add extra coconut milk, 1 tsp at a time, if needed for consistency. Cover and chill the mousse in the refrigerator. Divide the mixture evenly between 4 cups. 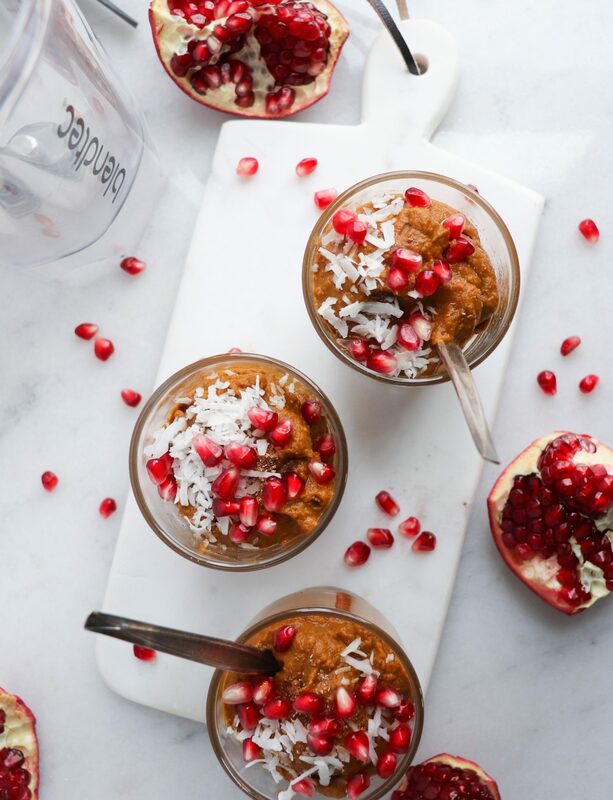 Top each with coconut flakes and pomegranate.